How To Remove Duplicate Content From Google Search Results? Whenever you write content online, there is always a chance of being copied by someone and published it on their own website. Most of the peoples do it out of ignorance but finally, it will affect your site’s traffic and rankings. Google is getting smarter with every passing day in finding the duplicate content in their search database and remove duplicate content but not always. If someone duplicates your content then you can use this tutorial to report that website and then google will remove that website from their search listings. When you report these copied pages then, Google will remove these results from their search database and your rankings will be restored. 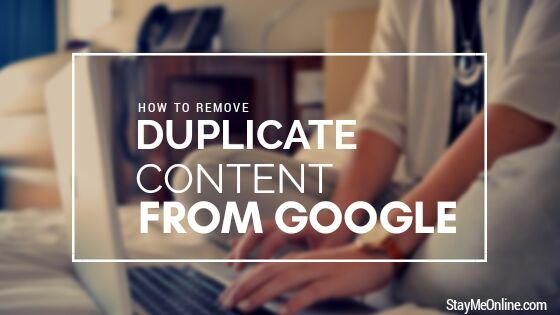 If you are reporting to remove duplicate content that’s on the BlogSpot/Blogger platform, Google will immediately delete this duplicate content. According to my experience, it takes around 2-10 days in taking actions. Google can only delete the blog hosted on Blogspot/Blogger. But if the blog who copied your content is a self-hosted website, then Google can only remove listings from their web-search index. But if you want to remove duplicate content from its website then you should submit a DMCA complaint to the web-host of that website. There are lots of tools like Grammarly and Copyscape which you can use to find the copied content on the internet. Copyscape is a great tool to find the copied content on the whole internet effortlessly. 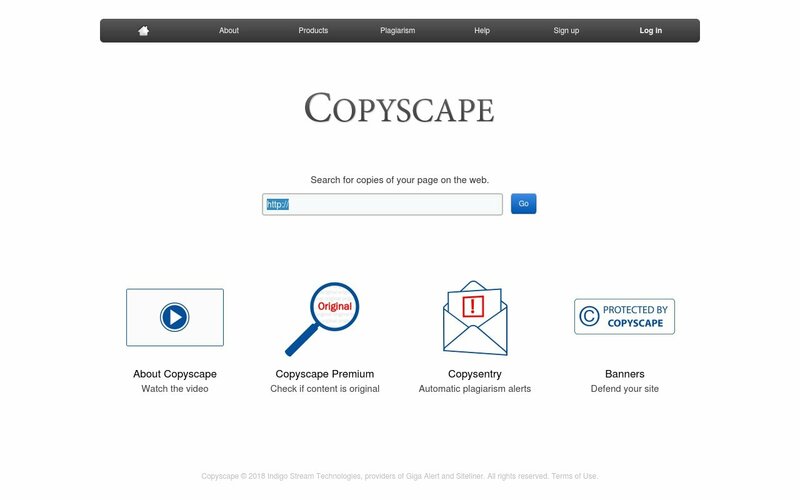 You just have to visit Copyscape.com and then type/paste the URL of the page for which you want to check. It will show you a list of websites that copied your content. Its one of the simplest tool to find copied content for any type of website. Copyscape Premium: Its a paid plugin available in WordPress plugin repository. This plugin helps you to check if a WordPress post is original before it’s published, by using the Copyscape Premium API to check for duplicate content on the web. The plugin will also add a ‘Copyscape Check’ button to the WYSIWYG editor, which allows you to check your posts whenever you wish. You can also set the plugin to automatically check the posts whenever anyone clicks ‘Publish’ and/or ‘Update’. If Copyscape will find any duplicate content in a blog post, then it will show a report of matching pages. You may also see a detailed comparison that highlights your content on the found page. There are a lot of Plagiarism checkers available on the Internet, which lets you check the blog posts for duplicate content. But, I would recommend you to use Plagiarism checker for Small SEO Tools. Its one of my favourite Plagiarism Checker. You have to just copy the content and go to the Plagiarism checker and paste it. It will do the rest of things. It also shows you the percentage of the duplicate content. They also provide a WordPress plugin with free and paid plans. You can download and check its plans and pricing and guide here. We have already written an article on How to save your blog from Plagiarism you can read it here. You can also check for duplicate content manually by picking a line or paragraph of your content and searching on Google within double quotes. Here’s an example of it. “There are a lot of Plagiarism checkers available on the Internet, which lets you check the blog posts for duplicate content. But, I would recommend you to use Plagiarism checker for Small SEO Tools. Its one of my favourite Plagiarism Checker. You have to just copy the content and go to the Plagiarism checker and paste it. It will do the rest of things” copy it and search on Google. Now, you have already identified the website who copied your content. 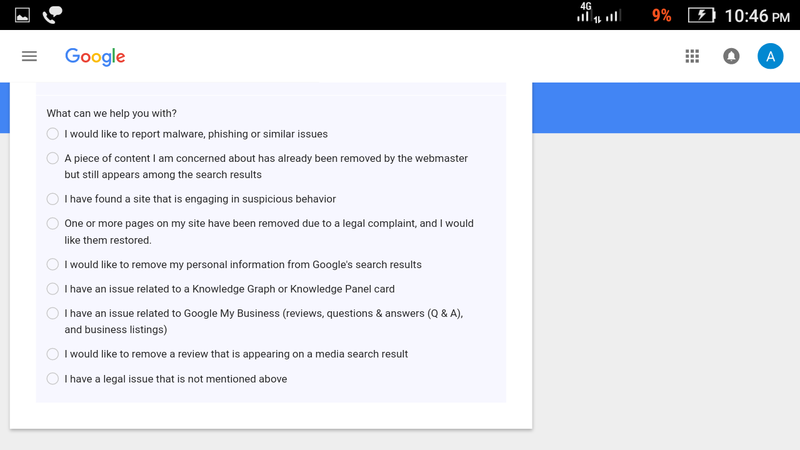 So, you have to now report it to Google Webmasters. For reporting, go to the Google DMCA page and click on “This tool” link under Submit a Legal Request section. Now, select the rest of the options according to the problems in your case. As most of the time, the blogs are of self-hosted WordPress so, I am choosing Web Search from these options. In the following section, choose “I have a legal issue that mentioned above” in the next section. In this section, choose “I have found content that may violate my copyright” an answer from the options. Choose “Yes, I am the copyright owner” and then choose “others” in next question. After answering all these questions, it will give a link “this tool” in the last paragraph which will at least you to the page where you can report the webpage that copied your content. If you’re reporting a Blogspot blog, then you have to select “BlogSpot/Blogger” in the first question. Now fill out the form on the next webpage and report all of the web pages. You can use one single form for reporting multiple links. You have to fill this form according to the directions given on the page. Just answer all the questions asked on that webpage. After filling this form, your report request will go under review which will take about 10 to 15 days. All these reports are reviewed by humans not by bots, so it will take time. After your report will be reviewed, you’ll get the lost traffic back within few days. You’ll also get your rankings and stolen traffic back when they remove blogs of those copy-paste bloggers. If they are using AdSense ads on their blog and then you can use this form to report so, their AdSense account will be terminated. You can save a lot of traffic from being lost just by spending some time in reporting these blogs. I know it’s very boring work, but you have to do it if you don’t want to lose your traffic. Please share this article with your friends and followers on social media. It would give smile on our face. If someone copied your content and you reported it, then please let us know about the results. Have you got your lost traffic? A website copied my 5 articles and it outranked me on those topics. I have no idea what I do, hope this thing will work. You should immediately report that website and you’ll get your lost traffic and ranking back. I have also faced the same in intial days, someone copied my all blog posts. That time, I simply searched the WHOIS details of that website. And call him to remove… He removed all. In your case you can also do the same if you will not get any WHOIS details then must contact to the admin using contact form. Because if you do so theb the copied content will be removed from both places( website and SERP) instead of SERP. If this all will failed then must use the Google DMCA tool. For more tips and guidance. Very Helpful article. Finally the copied posts removed from SERP. Thanks for this informative article. Know i can remove duplicate content. Know i can remove duplicate content. Glad to hear that it helped you. Very interesting and useful article for people who wanna avoid duplicates and rank higher and avoid Google SEO penalties. Hi, thanks for sharing your great article with us. Blogs are not just for socializing with others but it can also give us useful information. like this just like me I’am a new blogger and this article gaveme lots of ideas on how to start blogging to a site or posts.